The lines and decorations of this refined vase draw inspiration from those of a pear-shaped vase which was found at Santa Anastasia’s Sacred Well in Sardara depicting a nuraghe with five towers and the typical symbol of concentric circles. 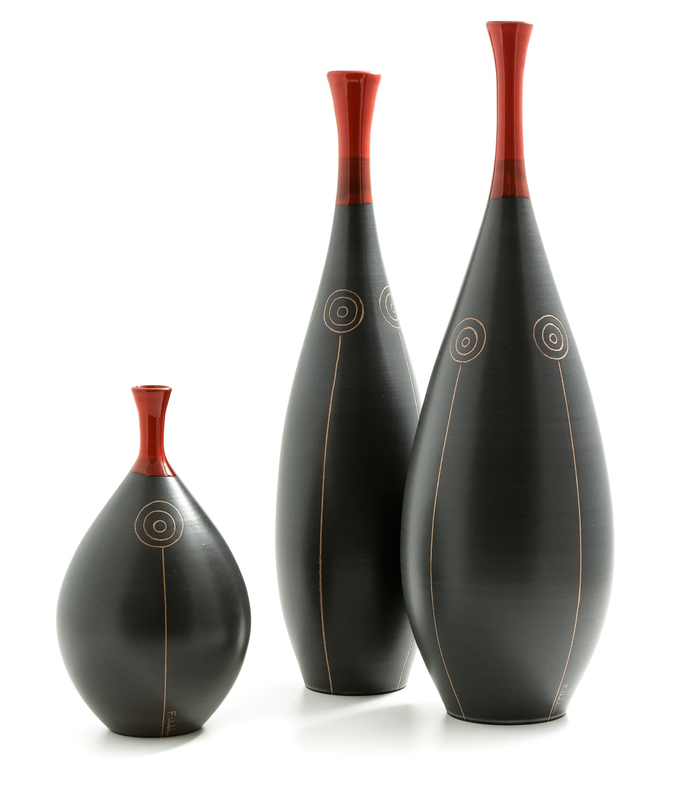 The elegantly shaped matte black bottles with a long bright red neck are graphically decorated with concentric circles inspired by the symbols of the Nuragic civilisation. 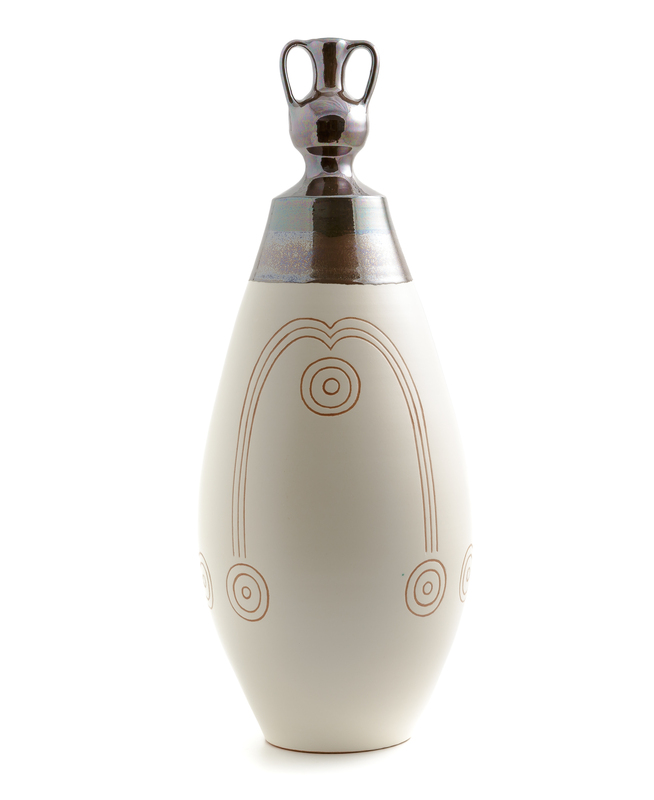 The original lines of the pouring vase are inspired by the shapes of the Askoide jug of the Nuragic civilisation and interpreted with striking formal synthesis using white and iridescent metal glazing. 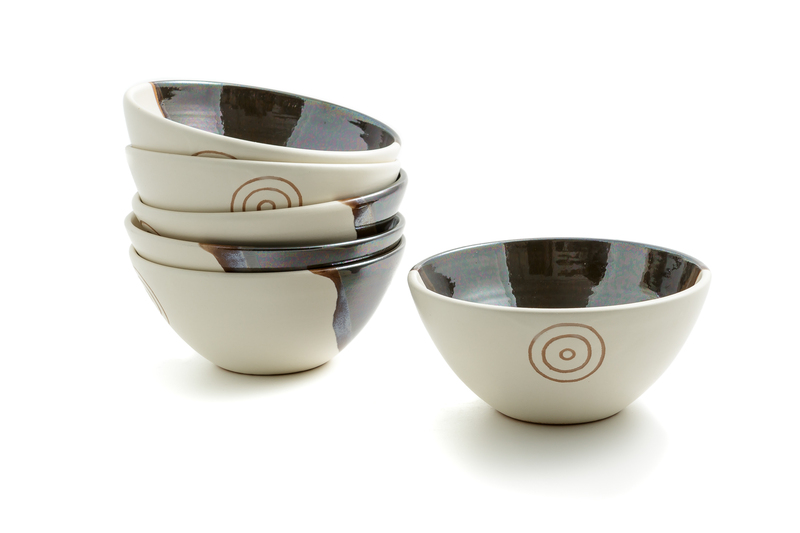 These ceramic bowls are harmoniously decorated in two colours, white and iridescent metal, with the expressive graphic symbol of concentric circles inspired by the Nuragic civilisation. The elegant vase decorated with a small jug at the top is an expert reinterpretation of the caracol (snail) jug of the fine ceramic production of Oristano, typical of special traditional occasions. Francesca Addari interprets the lines and symbols of the archaic Nuragic culture with remarkable aesthetic equilibrium in a distinctive ceramic production characterised by essential and yet unusual shapes, decorated with accurate, striking graphic lines. An expert of the pre-Nuragic and Nuragic civilisations, after training as a primary teacher Francesca’s self-teaching of ceramics revealed her natural talent and aptitude for plastic crafting, which she devoted herself to, and which can be seen in her lathe-shaped pottery. In 2002 she set up her own shop/workshop, l’Antica Arte della Ceramica, in Usellus, a small town in the Upper Marmilla region in an evocative naturalistic and archaeological-historical setting, where, drawing inspiration from the island, she tirelessly creates artefacts in which she revisits the typical forms of the Nuragic civilisation through stylisations of elegant contemporary taste. 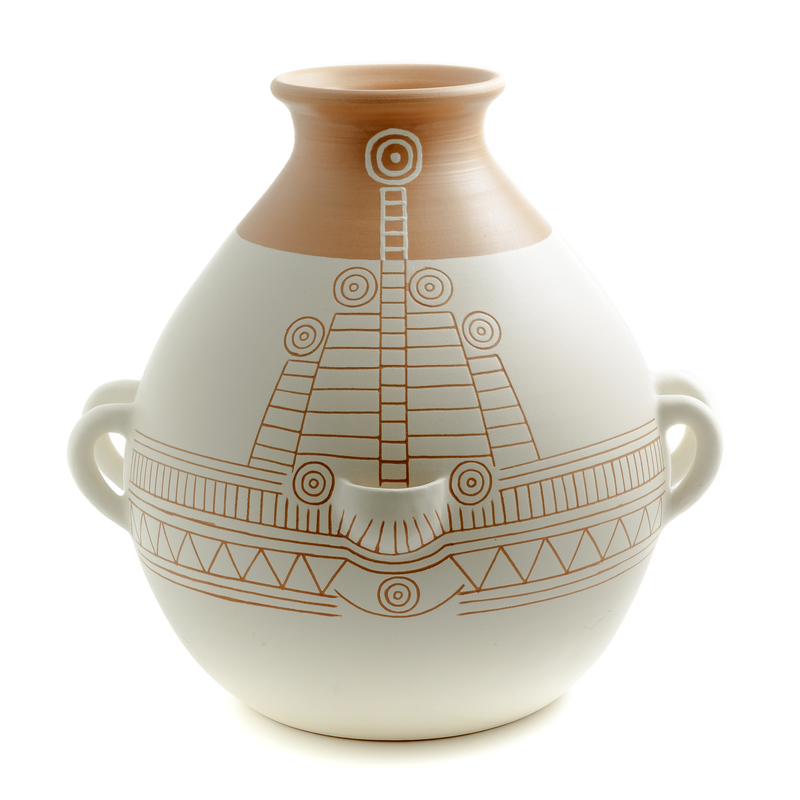 Her furnishing accessories are distinctively decorated with glazing and graphic symbols on white or black slip in contrast with the warm colour of terracotta. Active and in synergy with the current creative context in Sardinia, Francesca participates in the main exhibitions where the different handicraft businesses are represented. Francesca Addari’s refined production of tableware and home décor accessories counts several lines of expertly lathe-shaped ceramics featuring stylised lines and graphic decorations inspired by the archaic culture of Sardinia. 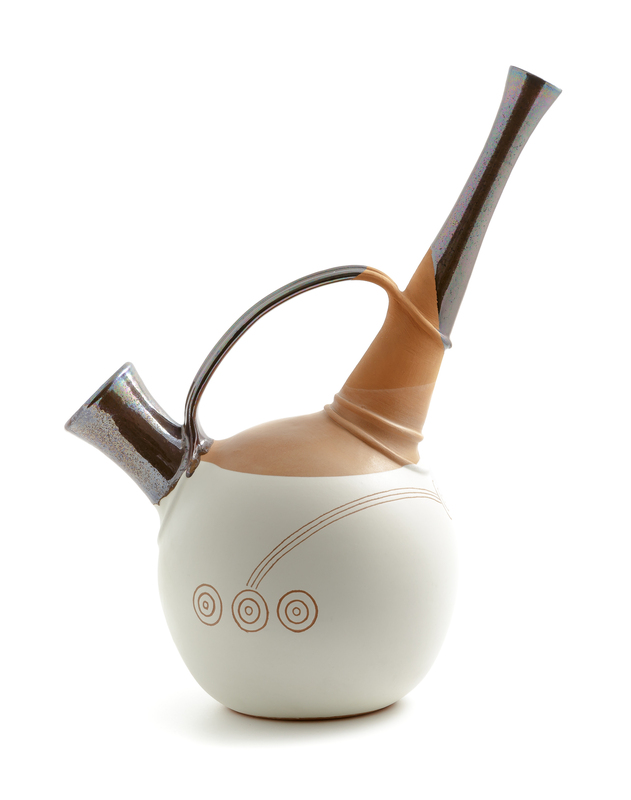 The Nuragica line, one of her “classics” inspired by the decorations of the pear-shaped Nuragic vase, is characterised by neat forms with slip and white glazing against warm terracotta surfaces and by sgraffito and paintbrush decorations. Further formal interpretations decorated with slip, enamels and crystals in black and red or in white and iridescent and metallic grey stem from the above-mentioned line, whose hallmark is the symbol of concentric circles, taken from the Nuragic civilisation. This craftswoman’s artefacts are lathe-shaped, decorated with slip, sgraffito, ceramic glazing and enamelling.